Comic book characters have become the “new” mythology, as writers such as Grant Morrison have so eloquently stated on many an occasion. Superheroes are now the new deities, with the rich storytelling potential beyond endless for these inspirational and aspirational characters. The proliferation of superhero films and their popularity over the years is just one example of comic book characters’ ubiquity in the worldwide culture. However, superheroes are not the only vessels in which grand and metaphorical storytelling can be expressed within. 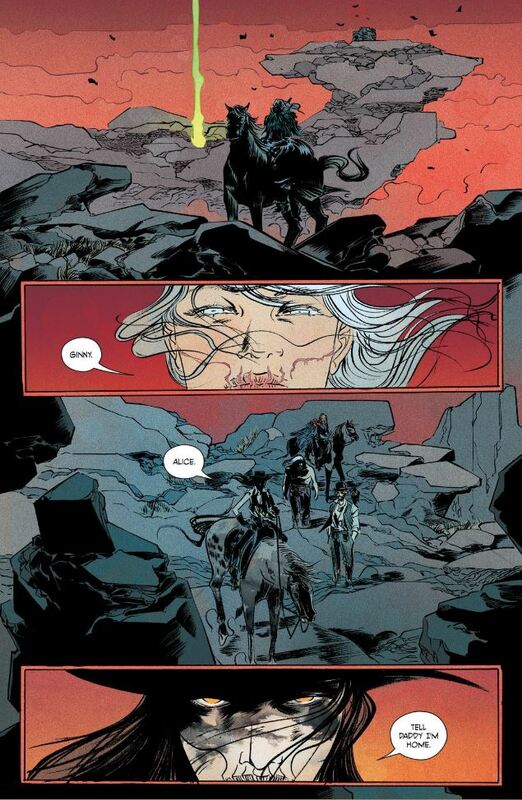 Writer Kelly Sue DeConnick, with artist Emma Ríos and colorist Jordie Bellaire, has created a rich metaphorical tale with the book “Pretty Deadly”. DeConnick and the artists involved have crafted an intricate world that celebrates the power of storytelling and it’s endlessly imaginative possibilities. Demanding multiple readings, this dream-like book entertains as it inspires. Like every great storyteller, DeConnick compels the reader to ponder the universal emotions and truths that are sometimes hard to face. With Ríos and Bellaire (along with expert letterer Clayton Cowles), DeConnick has collaborators that make her story come alive and shine. The world introduced by DeConnick, Ríos, and Bellaire takes place in a fable-like setting. Each issue in this first volume has Bones Bunny recall the book’s events to Butterfly. In the beginning of the first issue, a tale is told of a woman named Beauty who is imprisoned by her lover, Mason. When Death comes to visit Beauty, they fall in love. Beauty eventually gives birth to their baby, Deathface Ginny. Death takes the child away and raises her to be “a reaper of vengeance”. Other characters populate this book, such as a blind man named Fox and the child he protects named Sissy who wears a coat resembling a vulture (feathers and beak included). Other characters appear at times and then aren’t seen again until later on in another issue, but never confusing the reader. One must immerse themselves in this book and ignore the need to follow the minutiae. Letting this tale wash over you in waves (both small and gargantuan) as it occurs is the only requirement in finding both enjoyment and great depth in the intricacies of this book. Each individual reader will gain something from this artistic team’s fable and will quite possibly be moved to tears over the universal (and sometimes intense) emotions that include sadness, joy, and frustration. DeConnick has created, with Ríos and Bellaire, powerful new characters in Deathface Ginny, Fox, Sissy, and the rest of the “Pretty Deadly” cast. Each character personifies a part of humanity’s journey, with the metaphorical shading of each one of them adding to, but not hindering, the fun of the book. Deathface Ginny is propelled by her need for vengeance. Fox is racked with guilt and on a search for redemption. Sissy is an intelligent little girl who desperately wants answers to the meaning of her life and the world around her. The other characters on the periphery are integral to the story as well and are vital to the tale’s tapestry. Each one aids the book in building to the conclusion of its first arc. They are all interconnected in a natural way and add to the rich canvas that DeConnick and company are building upon as “Pretty Deadly” progresses toward directions that promise to delight and surprise. “Pretty Deadly” does not fit any one genre. It has a little bit of a spaghetti western flavor mixed with magic, sword and sorcery, the horrific and the macabre, and a little bit of superheroics and action thrown in to make a storytelling stew unlike anything else on the shelves. DeConnick is able to entertain with this mix of styles while telling a tale that is much deeper than what the surface contains. Through different motifs strewn throughout these first issues, DeConnick’s rich metaphors come to vibrant and, at times, subtle life. Feathers, fire, the yin and yang of the sun and moon, and skeletal bones are just some of the motifs that make their presence shown for reasons that are begging to be explored. DeConnick’s writing is gorgeously enhanced by the art of Emma Ríos. Her art is reminiscent of artist Paul Pope, but she has transformed that influence into a style all her own. Like Pope, Ríos’ art has a perfect mixture of reality and the macabre. Many of the characters’ faces have deep lines and are far from perfect. Some, like Big Alice, have ethereally smooth faces. No matter who resides on any given page, pure expression shines through these characters. The macabre is evident in Deathface Ginny and the skeletal lines adorning her face. From the fantastical (Bones Bunny and Butterfly) to the heartbreakingly human (Sissy), the imperfections of each individual contributes to the magical world created by DeConnick. This scene gives a whole new meaning to bed head. Through the simplicity of her art, Ríos creates great beauty. In a scene between Johnny and a prostitute, the purple hues of the prostitute’s hair blends into the purple of the bed where both characters lie. In a scene such as this, Ríos proves she is inventive and can create a scene of great beauty and intricacy in simplicity. She is also a genius at page layouts and dismissive of the classic ideas of the splash page and the rigidity of panel placement. In one gorgeous two-page spread, Big Alice’s scene on the left side contrasts and blends in amazingly into the scene on the right involving the Night Maid and the Day Maid. One mysterious world blends into an even more mysterious realm, with Jordie Bellaire’s colors enhancing pages that can be experienced in all their grandeur without having to read one word. Inventive art and layouts mix with vibrant colors to create a work of art. Bellaire is deserving of the high praise she receives for coloring what seems to be a vast amount of titles. She puts so much thought into her choice of colors and, like all the books bearing her name, has enhanced and contributed greatly to “Pretty Deadly”. The fable-like and otherworldly quality of the writing matches the artwork flawlessly. The fiery yellows and oranges light up flashbacks told by Sissy at the beginning of the first issue. Intensely dramatic, the colors match the drama of the action. In the same issue, Bellaire is able to make a blue night sky into something much more complex and ominous than the average sky of another comic book. She is one of the best colorists because she is able to make a world pop magnificently off the page. The book comes alive because of her artistry and, like Ríos’ art, helps express the magic and metaphor of DeConnick’s story. 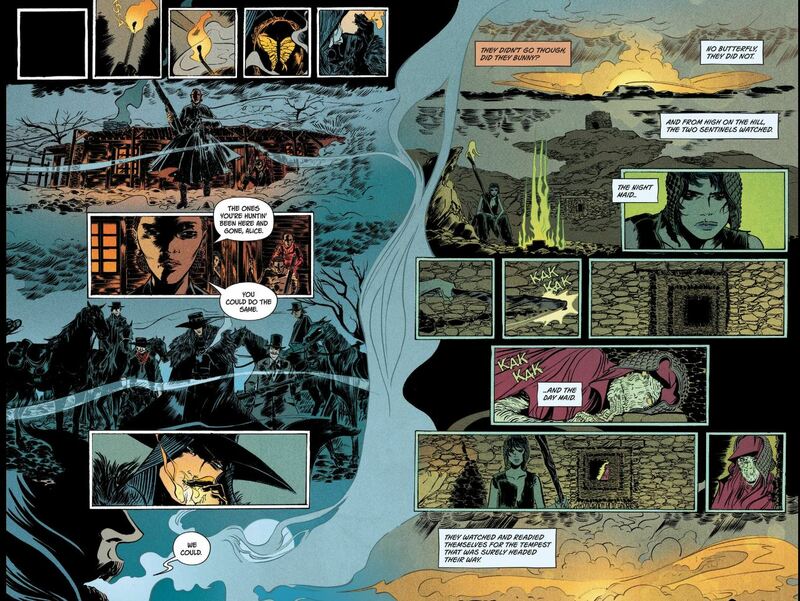 “Pretty Deadly”‘s story is one of vengeance, forgiveness, and rebirth. It’s the story and exploration of humanity’s deep, and sometimes violent, emotional depths. DeConnick has created a memorable mythology to stand tall next to the best of the superheroic myths that have survived for decades. The storytelling skills of DeConnick intertwine with the art of Ríos and Bellaire to create a book that, like life itself, has the capability to instill both wonder and horror.